Zhang et al. 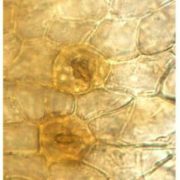 investigate the regulation of apical hook development in Arabidopsis thaliana. The Plant Cell (2018). https://doi.org/10.1105/tpc.18.00018. By Xing Zhang, Yichuan Wang and Hongwei Guo. Background: For sessile plants, survival in dynamic nature is never easy! The very first challenge most seed plants need to overcome is protruding through the covering soil without damaging their tender, soon-to-be-green tissues, such as their cotyledons and the apical meristem. Once they successfully emerge from the soil, the seedlings receive light and initiate photosynthesis. Otherwise, they die buried. 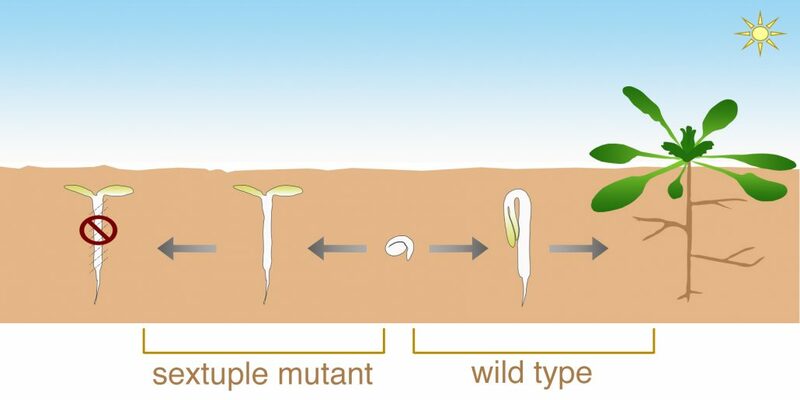 Most dicots, such as the model plant Arabidopsis thaliana, develop an apical hook, which bends the cotyledons and meristem downwards, to deal with this first challenge. Previous studies revealed a positive correlation between hook angles and the rate of successful emergence from the soil. 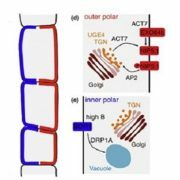 Meanwhile, multiple signals were documented to finely regulate the developmental processes of apical hook formation to assure successful emergence. 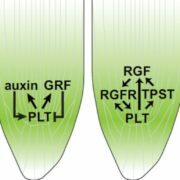 Questions: An obvious, yet unanswered, question is how plants integrate multiple upstream regulatory signals, including myriad phytohormones and the dominant environmental factor light, to an ultimate apical hook phenotype. We aimed to explore the mediating components and find how they bridge this gap. 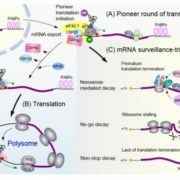 Findings: We found that two classes of transcription factors, ETHYLENE INSENSITIVE3 (EIN3)/EIN3-LIKE1 (EIL1) and PHYTOCHROME INTERACTING FACTORs (PIFs), function in parallel to integrate multiple upstream signals and promote hook curvature by activating the transcription of HOOKLESS1, which encodes an essential component for hook formation. 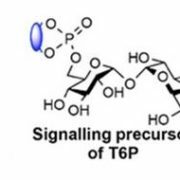 Either the protein abundance or activity of these two kinds of transcription factors is modulated by various upstream signals. 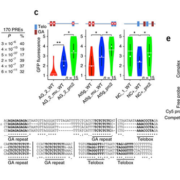 Acting together, EIN3/EIL1 and PIFs alleviate the negative effects of repressive signals and facilitate the positive effects of stimulative signals. Simultaneous lack of EIN3/EIL1 and PIFs causes a complete hookless phenotype and insensitivity to upstream signals. 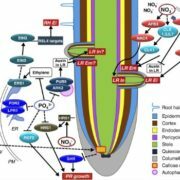 Next steps: The working mode of EIN3/EIL1 and PIFs as integrating nodes sheds light on possible mechanisms by which plants deal with complex environmental factors along with development. 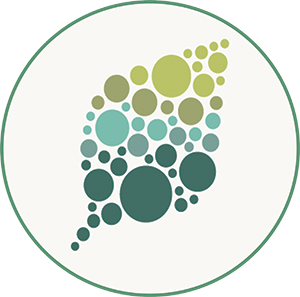 Additionally, the presented mechanism provides targets that could be manipulated to modify the emergence rates of diverse crops in accordance with changing soil conditions. Xing Zhang, Yusi Ji, Chang Xue, Honghao Ma, Yulin Xi, Peixin Huang, Huan Wang, Fengying An, Bosheng Li, Yichuan Wang and Hongwei Guo. (2018). 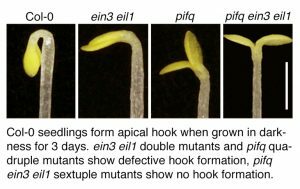 Integrated Regulation of Apical Hook Development by Transcriptional Coupling of EIN3/EIL1 and PIFs in Arabidopsis. 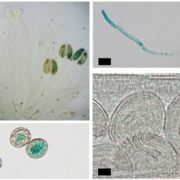 Plant Cell 30: 1971-1988. https://doi.org/10.1105/tpc.18.00018.